5 promising trails to explore while waiting for all-out spring. IN THE SPRINGTIME, I start to get antsy. I want to hike, yet most of my beloved trails are covered in enough snow to dissuade me. Rain and fog, however, do not keep me indoors. When I am longing for fresh air, I turn to lower elevations and a beauty particular to the Pacific Northwest — the sharp smell of salt air, vistas touched by fog and trees rising into mist. Whether it’s a beach or an easy hike near the water, there is plenty of mileage (and beauty) available to sate my craving to be outside — and at least one trail that can conveniently train you up for the tougher hikes awaiting you on the other side of spring. Here are some of the most promising winter/spring transitional places to hike, play and stretch your legs, all within a three-hour drive of Seattle. If only I could say I’ve accomplished this roughly 11-mile beach walk/hike. It’s on my bucket list to make it the full 5-plus miles out to the lighthouse and back on this National Wildlife Refuge. With an incredible array of birds and vistas of the sea, and enormous, snow-capped mountains behind you, you’ll have plenty to keep you in wonder. While it’s basically flat, you’ll experience a major challenge walking on the beach and driftwood. Be sure to check the tide table first. This spectacular hike is the one on the list with enough elevation gain to get your heart rate going. Featuring gorgeous, wandering paths through forests, sensational views and a location on the water, this trail is accessible year-round. Oyster Dome is perfect for spring trail training and is my go-to when I’m hankering to push myself up to a viewpoint. If it’s a clear day, you’ll reap the rewards at the top. If not, revel in the beauty of the forest, anyway. You can add more mileage and elevation if you start lower, from Chuckanut Drive. This beloved state park is one of my family’s favorite winter/spring jaunts. You can relax at a beach, discover secret coves or challenge yourself to cover a lot of hiking terrain. 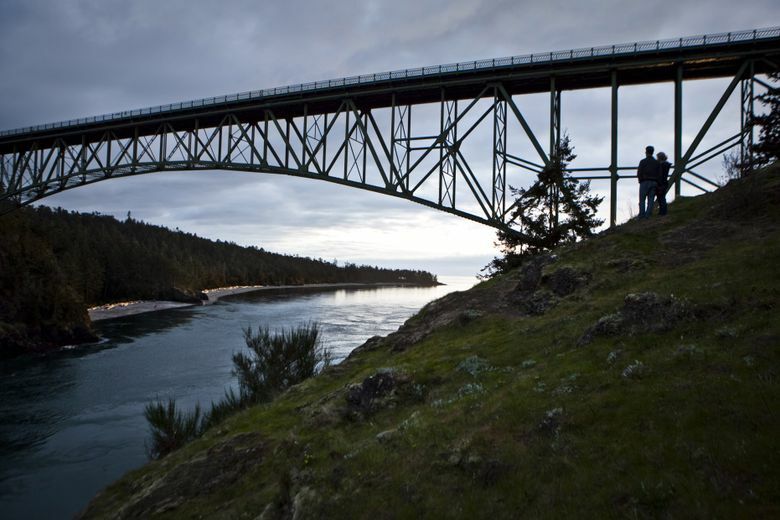 With trails heading to different islands and unveiling surprise vistas of the Deception Pass bridge, you can spend hours exploring. With miles of walking and mixed-use trails, you can look for whales framed by the Olympic Mountains, and explore old bunkers and gun locations built as a coastal defense during World War II. You also can extend your hike with loops. With a combination of beach, bluff and history, Fort Ebey is a lovely place to explore. With shoreline on Puget Sound and 11 miles of hiking trails, this gem of a state park is tucked between Seattle and Tacoma. You can wander the beach at low tide, or take off for a longer walk to stretch and enjoy the combination of water views and trails.